When Redland City residents go to the polls for the federal election, they will also have the opportunity to make a real contribution to the future of their City. 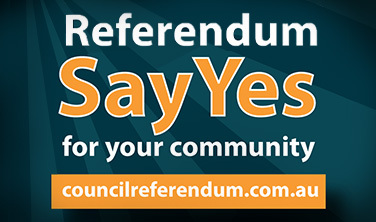 A referendum will be held in conjunction with the Federal Government election. Redlanders and other Australians will have the opportunity to ensure local government – the tier of government closest to the people – is recognised in the Australian Constitution. You can achieve this – and protect Federal Government funding paid direct to local government – by voting “YES” in the referendum. While Constitutional amendments can be confusing, there are simple and straight forward reasons why this important change needs your support. While these funding arrangements have existed for many years, recent High Court rulings have made it clear that they are actually unconstitutional, putting them at risk. If funding from the Federal Government is provided to the State Government to pass on rather than direct to councils, funding decisions for local areas will be made by a political party (whichever holds State Government at the time), not local councils who are at the grassroots of communities and know their needs. The Queensland Government takes approximately 15% in administration fees when passing on funding. The video contains a simple, concise message that encapsulates the key messages of the referendum campaign – the ultimate focus being on gaining funding certainty for our communities.